Knoxville, IA — (June 4, 2014) — Knoxville Raceway is proud to debut its brand new TV show, Thursday. 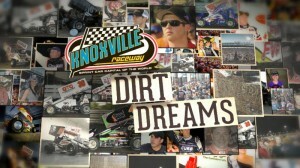 Knoxville Raceway’s Dirt Dreams, will air on Thursdays for 18 weeks starting June 5th at 11am and 2pm. Knoxville has always been a premier racing facility in the world but with the new show, fans can take a look behind the scenes and see why drivers can rise to levels of stardom like former sprint car drivers Jeff Gordon, Tony Stewart, Kasey Kahne and Kyle Larson. The great high speed action that many fans have fallen in love with will be on display for a national audience to see on MAVTV. Knoxville Raceway’s General Manager, Brian Stickel says the drama and excitement that happens each week in Knoxville will be portrayed in a way that will draw new fans to the sport of open wheel dirt track racing. “MAVTV is the perfect outlet for the Lucas Oil Knoxville Championship Cup Series to reach all the fans who cannot see the event live,” Stickel said. “MAVTV is available in 65 million households, where people are hungry for real racing action and stories. Through this show we are determined to give it to them,” he said. The first-time sprint car fan and the long-time fan will both enjoy going behind scenes to see what really goes on every Saturday night. Many NASCAR stars got their start in sprint car racing and even today promote the sport. You never know when you will see the legends visiting Knoxville or possibly racing. Today, the next racing great could be found at Knoxville Raceway earning their way to the top. MAVTV is a network the whole family can enjoy. A network by the people and for the people, made in in America and American Real. Knoxville Raceway had more than 211,000 visitors to the famous half-mile dirt track in 2013. Tickets are on sale now for the 2014 Knoxville Raceway season and the biggest sprint car race in the world, the 54th FVP Knoxville Nationals. Fans are urged to visit www.knoxvilleraceway.com or call the Ticket Office at (641) 842-5431.